Don't forget: The ADVISER BRIEFING REDUX will be held tomorrow, Friday, Sept. 7 in 214 Milbank from 12 - 1:30 p.m. for the advisers who could not attend the first session. Lunch will be served. As an adviser, you'll need to be able to help your first-year and sophomore advisees understand the Foundations curriculum. The curriculum, which went into effect for students entering Barnard in the Fall of 2016, prepares our students for the future by adding depth and breadth to our existing course of study. It emphasizes technology and digital learning; international and global learning; and the importance of quantitative and empirical reasoning. Our students are expected to study the local—our connection with New York City—and the historical, and to study and think hard about social difference. And with Foundations, Barnard is one of the first liberal arts colleges with a distinct technology requirement. 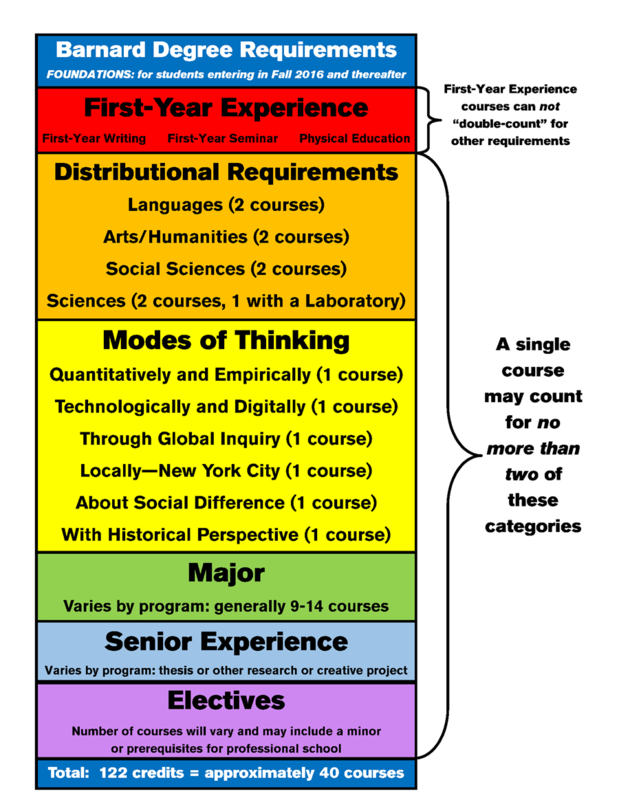 The graphic shown below is an easy way to help explain these requirements to your advisees. If you'd like to print a copy for your use, visit: FOUNDATIONS Degree Requirements. For more information on the curriculum, visit: FOUNDATIONS. Schedule meetings with ALL your Advisees to finalize their schedules and click “Review Complete” in Student Planning. To find more information for Barnard Advisers, including past issues of INSIGHTS, visit FOR FACULTY ADVISERS.